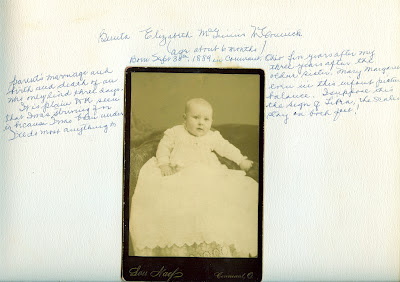 From my Grand Aunt Benita Elizabeth McGinnis’ scrapbook – written when she was a mere 92 years young. 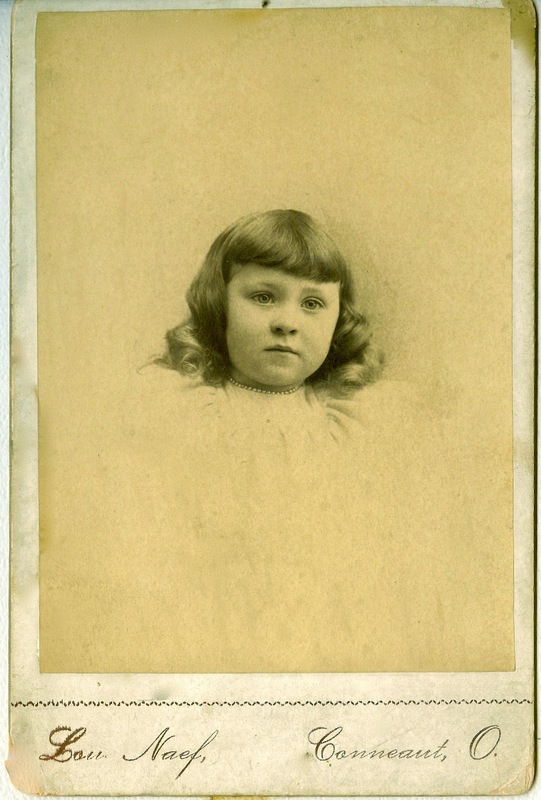 Born in Conneaut, Ohio, 5 years after my parents’ marriage and 3 years after the birth and death of an older sister, Mary Margaret, who only lived 3 days. It is plain even in this infant picture that I was striving for balance. I suppose this is because I was born under the sign of Libra, the Scales. I’ll do anything to stay on both feet! About 1902*. The dress I am wearing was a lovely blue. The goods were given me by my darling grandfather. ** My mother made it. The aunts gave me the pearls. I recall that Aunt Deal** carried me in the blue dress to gaze down at my grandfather in his bed. He had just died. I cried because he could not speak to me and tell me how he liked my dress. For my fifth birthday, I got this this lovely blue, brown, tan and gold plaid with a puffed neck yoke of gold silk. My hair was getting very long and I wore it in 8 curls. Each day Aunt Delia curled it and brushed the curls over her fingers to make them glossy. The words above were written by my Grand Aunt Benita (or Aunt Detty, as my mother, sisters, and I called her) in a scrapbook about her life she created when she was 92 years old. Aunt Detty was one of the most fascinating persons I have ever been blessed to know. She was born on September 30, 1889, the eldest of four children born to Thomas Eugene McGinnis and his wife, Mary Jane Gaffney. Her younger sister, Alice McGinnis, was my maternal grandmother. Although there was an age difference of 66 years between us, I feel we were kindred spirits who shared a love for and interest in many of the same things: writing and traveling, faith and family. She also was a renowned artist (though I missed the boat on that one) who was always trying new media and finding new ways of looking at the world. We spent many hours together, drinking wine, sharing stories, poring over photographs, and solving the problems of the world. A loving wife and mother and friend to all, she was my mentor and, in many ways, the role model of the kind of person I hope to be. 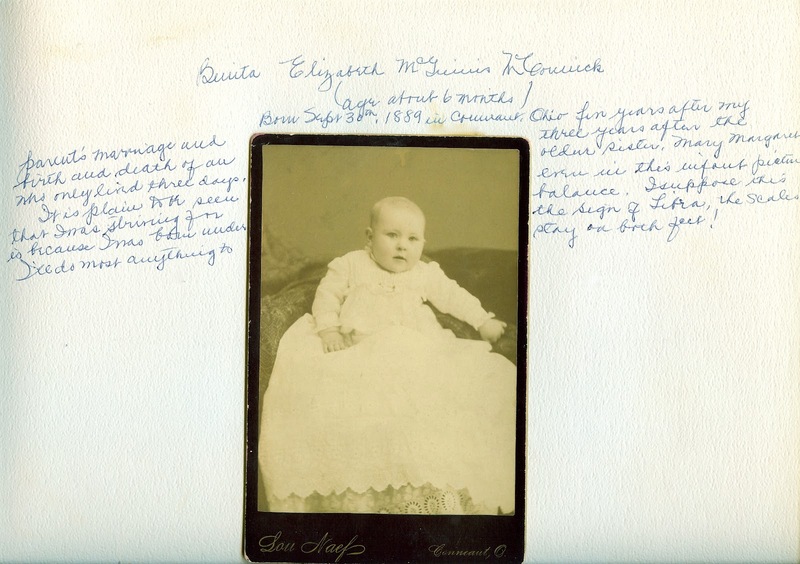 * Though Benita showed the date of her two-year-old self as 1902, it was in fact taken in 1892. She always did look young for her age! 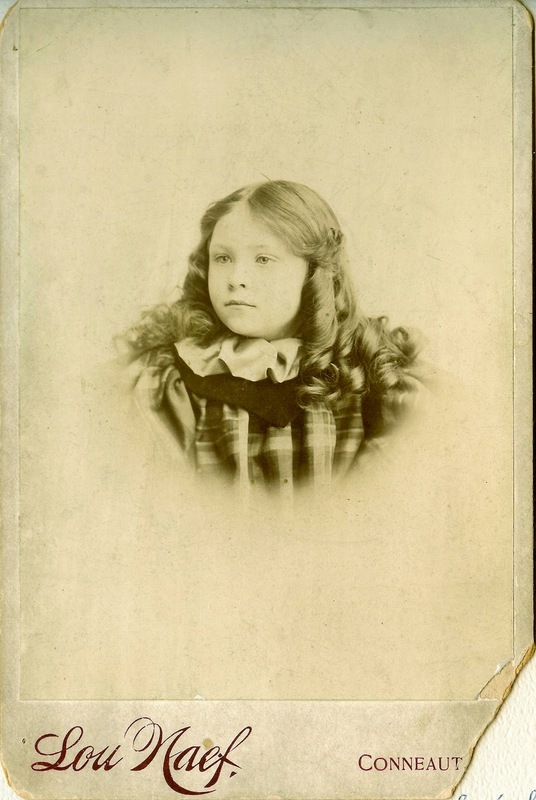 ** The (maternal) grandfather to whom Benita refers here was John Francis “Jeff” Gaffney, who died on February 28, 1892. *** Aunt Deal was Benita’s maternal aunt, Delia Gaffney. Delia went by several nicknames, including Di and Deal. There will be more – much more – to come about Aunt Detty in future posts.